JAKARTA — A surprise vote by Indonesia’s outgoing parliament to abolish direct elections for local government leadership positions has triggered fears that the move could deepen political divisions and undermine the country’s vibrant but still fragile democracy. After 12 hours of heated debate — broadcast live on Indonesian TV and punctuated by frequent breaks of lawmakers conferring outside the hall — a proposal to abolish direct elections for heads of local governments was passed in the early hours of Sept. 26 by 226 votes to 135. The proposal had been opposed by 80% to 90% of Indonesians, according to opinion polls. In an early sign of unrest ahead of the Oct. 20 inauguration of President-elect Joko “Jokowi” Widodo, people took to the streets to protest against the vote, although in limited numbers. In August, defeated presidential candidate Prabowo Subianto challenged the outcome of July’s election before Indonesia’s Constitutional Court and urged his followers to rally to his cause. This, too, saw demonstrators on the streets. The implications of the parliament’s decision on Sept. 26 are already reverberating throughout Indonesia’s vibrant but complex political system. Speaking during a visit to Washington D.C., outgoing President Susilo Bambang Yudhoyono said to the media he would challenge parliament’s decision through the Constitutional Court. “I am disappointed with the result and the political process in the house of representatives, even though I respect the process as a democrat. But I am really disappointed,” Yudhoyono, leader of the Democratic Party, said. Ironically, the president was partly responsible for the way the parliament’s vote against local leader elections unfolded. He drew the ire of citizens after his party’s lawmakers, of which there are 148, walked out of parliament ahead of the vote — which tipped the voting balance in favor of the parties opposed to direct elections. If the Democratic Party had participated in the vote, it would have been all but certain that the country would have retained the direct election system. Popular dismay at SBY, as Yudhoyono is popularly called, is making itself heard on social media, where the Twitter hashtag #ShameOnYouSBY started trending after the vote. “A setback in democracy. Is this the legacy you want to leave for Indonesian people, Pak@SBYudhoyono? #ShameOnYouSBY,” read one of thousands of similar tweets. The key force moving against local elections however has been Subianto — through his party, Gerindra, or Great Indonesia Movement Party. The Democratic Party supported Subianto’s failed presidential bid, after which Gerindra initiated the move to abolish direct elections, saying it would save money and curb graft. “More than 60% of regional leaders were linked to corruption cases because they have spent a lot of money. This is the new reality, the time to evaluate our system,” Gerindra’s Rindoko Dahono Wingit said after the vote. Djayadi Hanan, a politics lecturer at Jakarta’s Paramadina University, believes Yudhoyono, who has been in office for a decade, has tarnished his reputation as a democratic leader. In the end, Yudhoyono’s parliamentary members walked out after some of their proposals — such as including public vetting of local candidates — were rejected by other parties. Widodo is due to take office on Oct. 20, with negotiations ongoing over the composition of his cabinet. The Democratic Party had expressed interest in one of two cabinet jobs Widodo said could go to members of Subianto’s opposition coalition — possibly as a trade-off over the local elections bill. “Jokowi’s team could not make a deal with SBY and PD, and failed to give enough of a political deal to PPP (United Development Party) and PAN (National Mandate Party),” said Djayadi Hanan. Those latter two parties form part of Subianto’s so-called red and white grouping. Subianto claims the backing of more than 60% of MPs who will form the next parliament, and has hinted that the vote against direct elections presages future moves by his parliamentary supporters to sabotage Widodo’s reform agenda. Widodo, whose presidential bid was supported by the PDIP, firmly opposed the bill to scrap direct local elections — perhaps no surprise given he began his political career as a directly elected mayor in the Central Java town of Solo. The incoming president told media after the parliamentary vote that he would try to have the change reversed, but declined to say how he would attempt this. “Of course there will be further steps, but we will inform you later,” he said. Asti Suryo, a lawyer who works as assistant manager of Solo’s Danar Hadi museum, noted how the direct-elections system opened up Indonesia’s politics to outsiders, such as Widodo, who just a decade ago was selling furniture in Solo. “Before he became president, Mr. Jokowi won as mayor in Solo without being from the main parties,” Suryo said, emphasizing how Widodo, like several other directly elected mayors, was able to rise despite being outside the oligarchical party system. 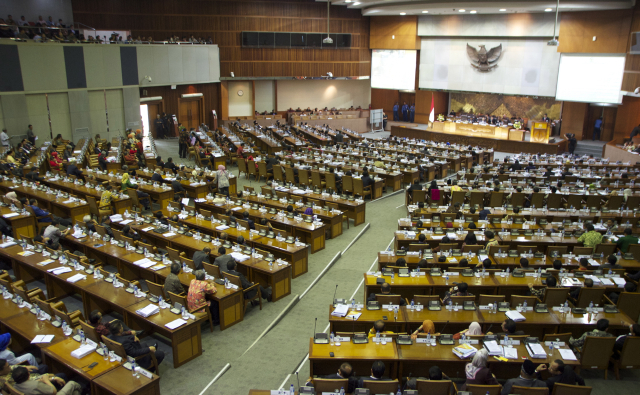 But parliament’s latest move means Indonesia will revert to the pre-2005 system in which local parliaments elected heads of local governments — though local parliaments will continue to be directly elected, as will national parliament and presidents. While public anger is mounting about the change, there are many who do agree with the change. There is even some support in Widodo’s hometown for reverting to the old format. “It is a part of Pancasila,” said Arif Sahidi, a partner at Kartika Law Firm in Solo, referring to Indonesia’s post-independence political philosophy. “We elect the representatives,” Sahudi said, noting that the change was not undemocratic as local MPs — themselves directly elected — would in turn choose the local mayor or district head. Yani and the other MPs who voted for change are out of step with Indonesian popular sentiment. Before the vote, opinion surveys suggested 90% of Indonesians opposed the abolition of direct local government elections. Inggit Fajar, an Indonesian studies student in Yogyakarta, a former center of resistance to colonial rule, sees the vote as a sign of regression: “It is less democratic, like during Suharto times,” Fajar said, referring to Indonesia’s authoritarian president who ruled for more than three decades. Reforms to Indonesia’s political system — including a so-called big bang decentralization program from 2001 — ushered in direct mayoral elections, held for the first time in 2005. Nowadays, the sprawling archipelago of 250 million people is usually held up as Southeast Asia’s most democratic country, and a notch less dynastic and somewhat less violent than the Philippines, the other key contender for the title. Nongovernmental organizations, many of which are politically active and which worked to ensure free and fair elections earlier this year, have flourished under this liberalization. “The participation of Indonesia’s civil society in promoting the integrity of the 2014 presidential election has been more diverse and active than in the two previous presidential elections, and has served a vital role in balancing the power of the contesting parties,” wrote Lili Hasanuddin, a program manager for The Asia Foundation in Indonesia. These words indeed suggest Widodo, who is Indonesia’s second directly-elected president, could face an increasingly hostile and aggressive opposition led by defeated presidential candidate Subianto. Evidently emboldened by the vote to scrap local elections, Subianto’s allies are now preparing a move to give parliamentarians the power to elect Indonesia’s president and to change house rules on impeaching a sitting president, according to PDIP sources.